The long wait is finally over, with several pairs of Shags apparently laying at Rinsey over the last week. There are only 14 pairs in the main zawn at the moment, with at least eight of these now on eggs, including four pairs on a full clutch of three eggs. This is a good six weeks later than last year when our first egg date was 8th March! It looks like our first Herring Gulls are also laying now in the zawn, but they (perhaps wisely) sit very tight, so it's not so easy to check clutch sizes. 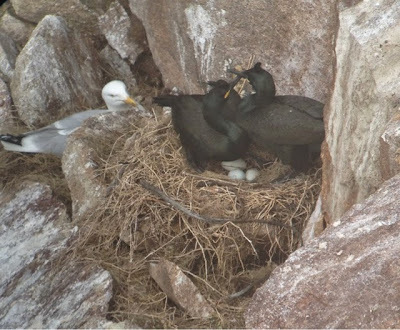 But at least two pairs have a single egg, with a dozen more birds probably also incubating.